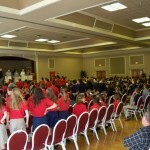 Here are some pictures of Focus 11 (vocation awareness day for 6th graders) in the Diocese of St. Petersburg. The Friars and the 3rd Order had a Mercedarian vocation table. To draw attention to the Order and promote a love of Our Lady of Mercy, the children signed up to win one of 3 three 12″ statues of Our Lady of Mercy for their classroom. 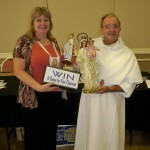 Thanks to Fr Tony and Sue for spreading the good news of the redemption to the youth in St Petersburg, Florida! Two Friars Approved for Solemn Vows. On Wednesday, April 6th, 2011 the Provincial Council approved Br. James Chia and Br Scott Brentwood for Solemn Vows. It has been a long journey for these two men from vastly different worlds. Br James grew up in Malaysia, an independent country in Southeast Asia. This country, still close to Br James’ heart, is very diverse. Besides the native Malays there are many other ethnic groups including Chinese and even some Europeans. The religious beliefs are even more diverse. According to the Population and Housing Census 2000 figures, approximately 60.4% of the population practiced Islam of which only the Sunni branch is allowed; 19.2% Buddhism; 9.1% Christianity; 6.3% Hinduism; and 2.6% practice Confucianism, Taoism and other traditional Chinese religions. The remainder was accounted for by other faiths, including animism, folk religion, and Sikhism while 0.8% either reported having no religion or did not provide any information. Despite all these differences of belief, Br James grew up in a devote Catholic family that emphasized hard work, honesty, and especially devotion to their Catholic faith. Br James will often be seen at work or helping others. Br Scott and Br James as Novices with the late Fr Marino. Br Scott, on the other hand, grew up in the United States. He and his family are from Southwest Virginia. He attended Carroll County High School in rural Hillsville, VA. Much of that area of the state is Protestant, yet Br Scott found the fullness of truth in the Catholic faith. After graduating High School in 2000, Br Scott went on to obtain bachelor’s degrees in Biology and Philosophy from Old Dominion University. Br. Scott is known for his intelligence and wit. He is always interested in having a good conversation about political science or religion or any number of topics. Br Scott is, also, always open to using his knowledge and talents to aide those in need. As providence would have it, these two vastly different men were inspired to join the Order as postulants in August 2004. Living at the Monastery of Our Lady of Mercy, they learned the basic tenants of our Catholic faith and how to live in community. Now after 7 years of formation, Br James and Br Scott are preparing to make their definitive consecration to God in the Order. Sometime this summer, they will together prostrate before the altar as a sign of their total submission to God. Then, they will kneel before the Major Superior and make vows of chastity, poverty, obedience, and the fourth vow of redemption. We congratulate Br James and Br Scott on being approved for Solemn vows. May the Lord who has begun this good work in you bring it to completion. Posted on April 15th, 2011 February 5th, 2013 Author adminCategories Vocations & FormationTags consecration, friars, mercedarians, Our Lady of Mercy, Solemn Vows1,385 Comments on Two Friars Approved for Solemn Vows.